Island Junk Removal Solutions is a full-service rubbish removal and hauling company backed by more than 10 years in the industry. We serve both residential and commercial clients, and remove anything, big or small. Do you have debris you’re not sure how to dispose of? Give us a call! We are experts in garbage disposal, recycling, and junk removal. Victoria and the surrounding municipalities are equipped with a host of options that allow us to recycle, donate, resell or dispose of any type of refuse imaginable. The key is knowing how and where to dispose of junk safely and properly. When we arrive onsite, we’ll sort your junk to determine what can be donated, resold or recycled. Our top priority is to ensure that as little as possible goes into the landfill, and to keep our environment pristine by repurposing items wherever possible! If we spot something that can be resold, we’ll either buy it from you directly, or sell the item to a local auction / second-hand shop and use the proceeds to reduce your final bill. After many years repurposing “another person’s junk,” we have an expert eye for overlooked items of value, and we know where to find the best resale price. We’ve come across some amazing finds over the years! Whether you’re downsizing your home, renovating, or cleaning up an estate, we’ll ensure you benefit from any treasures hiding in plain sight. This valuable service is especially helpful during estate clean ups, which is one of our specialties. We understand that this can be a daunting task at a difficult time. Our expertise and efficient service helps ease the burden for you, and we ensure the job gets done as cost effectively as possible. We will also sort out donatable items and drop them off for free to local charitable organizations. This way, usable items stay in circulation, which helps the environment as well as those in need! Our free drop-off service sets us apart and allows us to help support our community. Not sure how or where to properly dispose of recyclable materials? Let us handle this for you! We can recycle all manner of materials including metals, electronics, paper, cardboard, chemicals, oils, tires, appliances, lightbulbs, batteries and many items that don’t belong in the landfill. For example, we are often asked: is Styrofoam recyclable? The answer is yes! From electronics recycling and appliance disposal to old furniture pick up, we’ll do the heavy lifting and take the guesswork off your hands. And save you money in the process! We also specialize in hazardous material disposal and construction waste removal. From homes infested with bed bugs, to contaminated commercial gear and hypodermic needles, we are trained in safe and proper disposal. Not sure whether your drywall or construction waste contains asbestos? We’ll test it for you and haul away materials that test negative. If anything tests positive, we’ll point you in the right direction for proper disposal. The same goes for aggregate materials, commercial garbage removal, and garden waste disposal. We can help you with construction site clean up, yard waste pick-up, home renovation debris hauling, and small demolition of backyard structures like sheds, fences and patios. From garage clean outs to commercial site clean ups, our junk hauling services are fast, friendly and cost competitive. We’ll recycle as much as possible, and we know how to save you money! 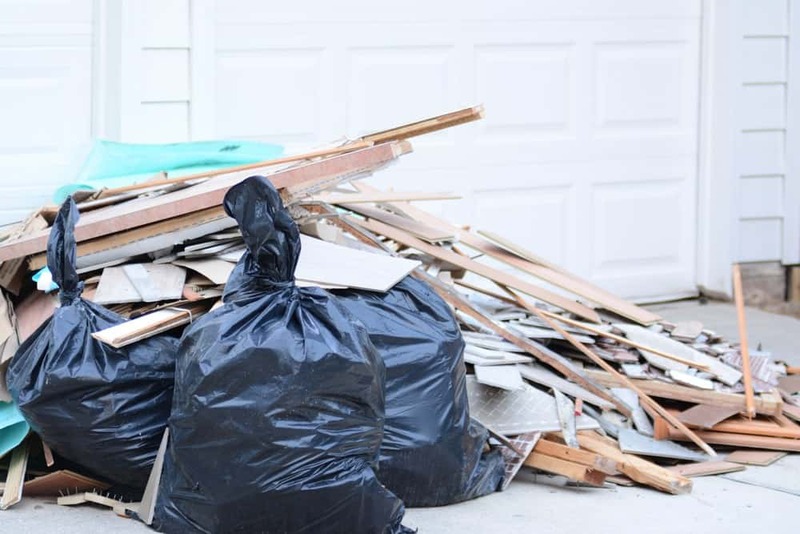 We get the job done and leave the site clean, ensuring a hassle-free junk removal experience for our customers. This is what we’re known for!